Review copy handed to me by the publishing representative. I wasn’t going to read this one. Really. After my issues with Cinder, I was going to let the whole series slide. But the Macmillian rep who comes by the store once a quarter handed this to me back in November with the words: this is a LOT better than the first. So, I took a chance. And was completely blown away. Scarlet Benoit’s grand-mere has been missing for two weeks, and she’s getting annoyed at the lack of leads in the case. It’s not a suicide, like the authorities have ruled: Scarlet knows her grandmother well enough to know that. But she has no idea where to start looking for her. Then a strange man called Wolf falls into her life, claiming to have knowledge — though he’s reluctant to share it — about where her grandmother is. They head to Paris to get some answers. Meanwhile, Cinder escapes from prison and teams up with an American to try and process all the information that’s been given her in the last 24 hours. Turns out that Scarlet’s grandmother may have information that Cinder needs as well. All that against the backdrop of an impending invasion from the very creepy Lunar queen Levana. The thing I liked best about this one, I think, is that Meyer gives us more of this fascinating futuristic world that she’s created. 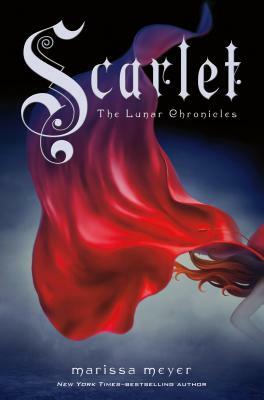 Sure, Scarlet is loosely based on Little Red Riding Hood, but it’s not so much a fairy tale as a story of what people will do for those that they care for. Which makes it sound deeper than it is. Really? It’s just a lot of fun, a great second novel in a series. (You don’t often hear that.) Which leaves me begging for the next installment. Yeah, I was just so impressed with how dramatically she stepped up her game. Full props. SCARLET is hella enjoyable.